Green Momster: "Chick'n" on a stick! Be sure to "like" greenmomster on Facebook to get all the meat-free Friday recipes and other environmental news! 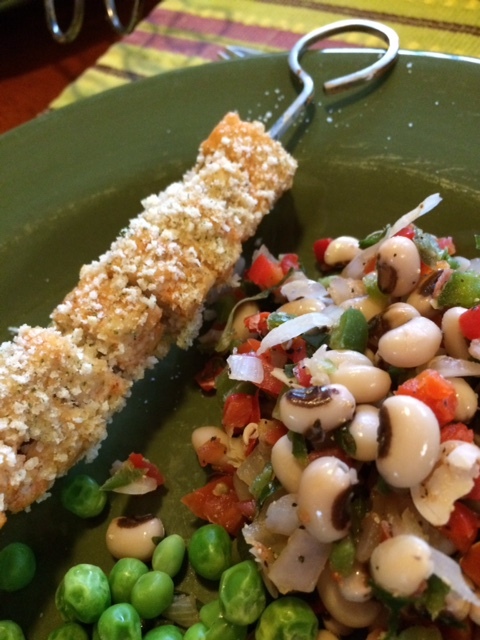 Sometimes you just feel like dinner on a stick, so this week's recipe is adapted from Lighten up, y'all. Classic Southern Recipes mad Healthy and Wholesome by Virginia Willis. I exchanged the main ingredient of chicken with a meat-free option, and it worked very nicely. It's a family-pleasing recipe, perfect for a spring Friday! Combine salt, 1 tsp paprika, 1/2 tsp onion powder, and 1/2 tsp garlic powder. Add buttermilk and mix thoroughly. In a flat plate, combine the breadcrumbs and remaining paprika, onion powder, and garlic powder. Add the 2 tblsp of oil and mix. In a separate bowl, combine egg whites and mustard. Take the chik'n tenders out of the marinade and put on skewers. Dip the skewers into the egg mixture and then roll in the breadcrumb mixture. Place on a rack and bake for about 25 minutes, rotating halfway through.